Heat oven to 350 degrees. Lightly grease muffin pans. Stir together water, oil, eggs and Krusteaz Double Chocolate Muffin Mix until well blended. Fill muffin cups 2/3 full. Bake 18-22 minutes. Cool 5 minutes; gently loosen and remove from pan. Cool completely. Slice each muffin into thirds, horizontally. On bottom third, spoon a dollop of whipped cream and a dollop of strawberry pie filling, then top with middle muffin layer. 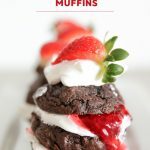 Repeat the whipped cream and strawberry layers; add muffin top. Finish with a dab of whipped topping and a fresh strawberry slice. Serve immediately.